Stanley Park is the most famous landmark in Vancouver, BC. 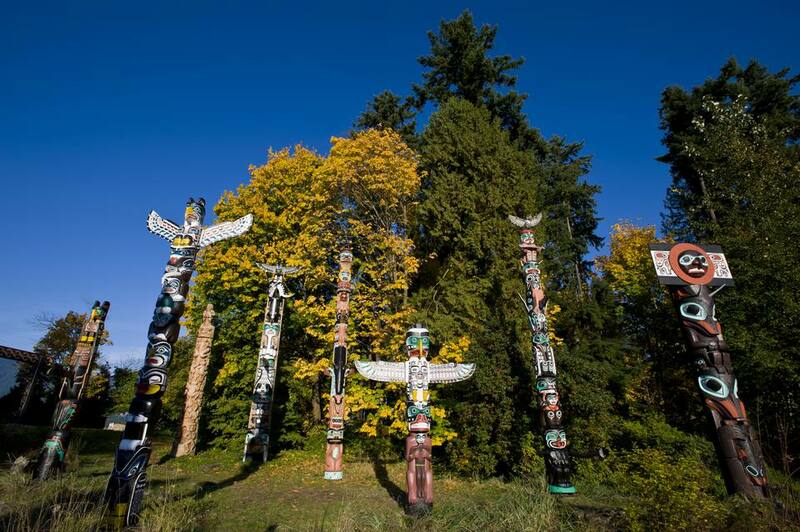 Of the Top 10 Things to Do at Stanley Park, the most-visited attractions are the Stanley Park Totem Poles. In fact, these totems are the most-visited tourist attraction in all of British Columbia (BC)! Located at scenic Brockton Point in Stanley Park, the Stanley Park Totem Poles are wonderful pieces of BC First Nations artistry. ("First Nations" is the term used for the native peoples of Canada. You can learn more about the history of BC First Nations at the​ UBC Museum of Anthropology.) Four of the original Stanley Park totems were from Alert Bay on Vancouver Island; additional pieces were from the Queen Charlotte Islands and Rivers Inlet on the central coast of BC. Because many of the original totems were carved as early as the 1880s, they have been sent to museums for preservation. The totems you see at Brockton Point today are new ones commissioned or loaned to the park between 1986 and 1992. The totem poles are located at Brockton Point, in the eastern corner of Stanley Park. Drivers will find pay parking along Stanley Park Drive, directly in front of the totems; walkers and bikers can reach the totem in just 10 - 15 minutes from downtown Vancouver. You can also see the Stanley Park Totem Poles on a hop-on, hop off sightseeing bus tour of Stanley Park. The totem poles and Brockton Point are along Stanley Park's Seawall, making it easy to include the totems in a biking/walking/blading trip. From the totems, you can walk to the free Stanley Park Rose Garden or the Vancouver Aquarium (a must-see, especially for families). If you drive, you can combine your trip to the Stanley Park Totem Poles with lunch or dinner with a spectacular view. When the weather is good, you can loop around Stanley Park--by car or by bike--and end your scenic journey at English Bay Beach, one of Vancouver's Top 5 Beaches. As mentioned, the best place to learn more about BC First Nations history is at the UBC Museum of Anthropology, one of the Vancouver's Top Cultural Attractions.